It was almost like a dream come true. Certainly it was a big deal for a person who is as comfortable with recognizing landings at Runway 27 at Bombay and taking off at Runway 28 at Delhi, just as anyone else would be with, say driving on the Western Express Highway in Bombay or along the Inner Ring Road in Delhi. Certainly it was a big deal for a person who is extremely pleased to spot a Boeing 747-400 or an Airbus 330, just as one would be pleased to spot a Ferrari or a Jaguar. Certainly it was a big deal for a person who is extremely passionate about the beauty and splendor of a Boeing 747-400, as if he owns one and is unable to stand any criticism of the Jumbo, just as a car aficionado would get pissed if someone were to doubt the capability and performance of his car. Certainly it was a very big deal…. 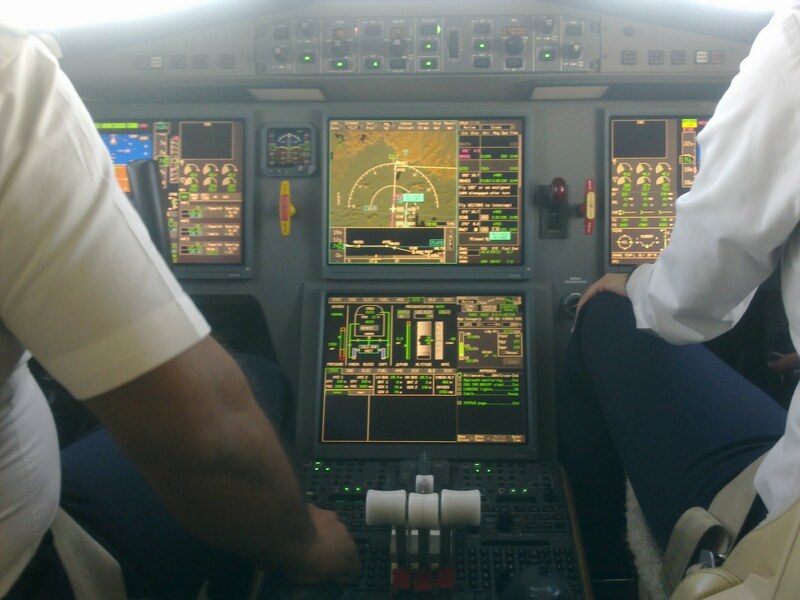 I happened to travel on a client’s private jet for work, alongwith a few fellow bankers and client representative. It was a beautiful little bird, the Dassault Falcon 900EX. But my eyes were on the cockpit, those little dials, those small screens were all visible from the cabin. I wanted to pounce on the opportunity to raid the cabin at the earliest. If you thought I had joined the bearded-turbaned mad gang, you would be disappointed. No I haven’t. I was really excited about the thought of seeing work in action in the cockpit, that thought was certainly driving me mad. I had visited cockpits of the Hawker Siddeley HS 748, Airbus A300 and McDonnell Douglas DC10, as a kid, but could never really figure out how they flew the bird. This time around, armed with some idea of flying, courtesy the FlightSim, I had a much better idea of what actually actually goes into flying an aircraft. The crew graciously accepted my request to visit the cockpit and the steward led me in. The captain handed me a pair of headphones so that he could explain the flight plan, while the co-pilot, a rather young and pretty lady, was in constant touch with the ATC, taki ng instructions on altitude and headings. The captain explained the functions of various instruments rather enthusiastically, despite knowing that I was a FlightSim regular! The captain and the co-pilot explained the route that we were to follow into Bombay which was pictorially depicted on the LCD screen. We took a turn east from the Arabian Sea, to fly over the Virar coast, over Thane, took an about turn over Vashi to align with the ILS glide slope on Runway 9! And now the ATC came into action – every couple of seconds, the ATC would check on the altitude which would be confirmed by the co-pilot and before I knew it, it was touchdown time!!!! For me, it was a big deal as I had always dreamt of becoming a pilot, as a kid, but could not because of my myopia. It was a damn big deal for me, one tick off on the “things to do before I die” list!